Hey, Dude Bro! 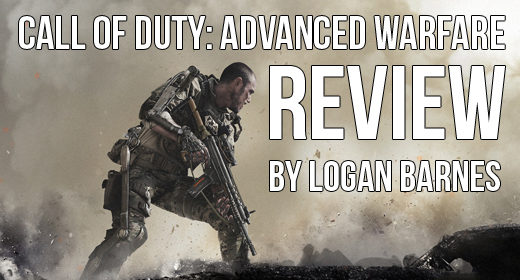 Don’t miss our review of Call of Duty: Advanced Warfare! The Call of Duty series is pretty well-known for its relatively unchanging yearly iterations. However, Call of Duty: Advanced Warfare seeks to set itself aside from its brothers-in-arms with new features and mixed results. While developer Sledgehammer does enough with Advanced Warfare to shake up the formula, the execution is not the best, which brings the game back down to the realm of its average siblings. While the single-player campaign is immersive and creative, it’s troubled by segments that do not mesh well with the excellent graphics and acting from its big name stars. The multiplayer, too, suffers from problems that make the new features seem inadequate. Both multiplayer and single-player modes struggle to shake the past and come out just as average as their predecessors. First off, the campaign seems to be well thought-out, attention grabbing, and expertly acted out by its cast of characters. The story follows Jack Mitchell and his journeys with the U.S. Marine Corps and with the private military corporation Atlas. The plot contains some amount of shallow mystery, but even if you know what’s going to happen, it compels you to watch how it unfolds. In fact, they give the story 6 to 8 hours to do the unfolding. While the story can be a predictable bag of machismo action, it’s a bag of machismo action that I want to keep playing. The game is beautiful, with some of the most polished, finished graphics I’ve seen on next-gen consoles. Seeing what explosion or future-tech the game wanted to show me next was a huge driving force in finishing the campaign. That combined with utilizing your “exo,” a powered-exoskeleton suit, and its new abilities, such as double-jumps and invisibility, mix up the monotony that has filled previous campaigns. The acting is also top-notch, with the performances from Kevin Spacey being the most intriguing. The introduction of talent like Spacey really helps to elevate this campaign from the level of typical shooter story to the level of a big-budget Hollywood action flick. In short, I’d gladly watch a Call of Duty: Advanced Warfare feature film. However, the campaign is definitely more interesting to watch than play. While the story is compelling, it’s broken up by too many “non-shooting” sections. The only times I really died were during the multiple vehicle chases with horrendously stiff controls or during some unexpected quick-time event with poorly placed button prompts. These segments pull you out of the “flow” of the game and degrade the experience. However, we all know multiplayer is the real draw in Call of Duty. With Advanced Warfare, it really shouldn’t be. Multiplayer in Advanced Warfare feels like an entirely different beast from the campaign. While most Call of Duty games prepare you for multiplayer through the campaign, Advanced Warfare’s multiplayer scraps most of the elements from the story and takes gameplay in its own direction. This leads to two dissonant experiences with the same coat of pretty graphics. For example, the creative digital weapon HUD in single-player is replaced with a flat, generic HUD. Your exo abilities have been relegated to entirely different controls and, for the most part, function drastically different from how they worked in campaign. And, while the special jumping movements that are granted by your exo are fun, they make the levels too vertical. The multiplayer maps seem like they were not designed with that much 3-D movement in mind and it reduces the maps to nothing more than big kill-boxes with very little use for cover. Other problems that plague multiplayer focus mostly on gear. Weapons can only be unlocked by reaching a certain level and there is no system to purchase your favorite weapon earlier than the specified level. This is incredibly frustrating when you’re forced to use a gun that you’re sub-par with for long periods. Not to mention there is a severe lack of distinct weapon choices to begin with. You can also unlock special versions of weapons through completely random “supply drops” that contain a combination of 3 cosmetic items, random effects, or enhanced versions of guns. You still cannot use those weapons until you’ve reached the requisite level. The whole system leads to a lot of undue frustration. Like that helmet you saw on that guy? Well, it’s up to a box that drops randomly and then randomly gives you items to see if you get it. Advanced Warfare does so much to set itself apart from its past iterations, but it executes some of the elements, namely multiplayer, in such a weak manner that it detracts from the final experience. It is still a better-than-average Call of Duty game. If nothing else, the game is worth a buy for the campaign, but definitely not at $60. Call of Duty: Advanced Warfare advances into a 6/10. @JustUsGeeks @CallofDuty The challenge of making a good game with a development team of 4,000 people.